In April of 1989, after working for over a year without a contract, Members of the United Mine Workers of America in southwest Virginia laid down their tools and struck the Pittston Coal Company. The ensuing ten and a half month strike, which much like today’s struggle, hinged on protecting and preserving the pensions and health care active and retired miners had earned during a lifetime of toil in the mines. In the course of the strike, the UMWA employed new tactics and devised different strategies for dealing with this renegade operator. 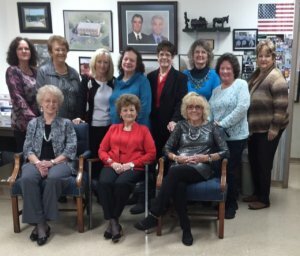 However, perhaps the most significant and lasting creation of that battle was when a determined group of wives, mothers, daughters and friends of the striking miners banded together to form what became the UMWA Freedom Fighters. “I have known and worked with the Freedom Fighters since they were founded over 28 years ago,” said At-Large International Vice President James Gibbs. “They organized themselves during the Pittston strike to stand in solidarity with the strikers. These are some of the best people I have ever met and I figured right then that Pittston had bitten off more than they could chew. These women were fighters and they weren’t going to stop until they won.